If you have the budget for a custom logo design it is the best option you can do for your business. Minimum budget for a custom logo design is $1500. The bigger your budget is the more detailed the process is. With the minimum option, you get 2 logo concepts and 3 rounds of revisions. The design process will take around 30-50 days. Please read both the "Design Process" and the "Terms" block below before filling the form. A good starting point is knowing how many types of logos are there, so please take a look at my Ultimate Logo Guide PDF for guidance. The minimum budget allowed is $2000. If you reside in Canada you will be billed in Canadian Dollar + 13% HST. And if you are residing overseas you will be billed in US Dollar only. Option A: You don’t have a logo and you wish to have one created. Option B: You have an existing logo but you want to completely redesign it into a different logo. If redesigning, what do you like about your old logo? And what do you dislike? You can have your logo uploaded in Dropbox/Google Drive and have it as a shareable link. Please see my “Ultimate Logo Guide” PDF available at the very top of this page. The most commonly used ones are Wordmark logos and Combination Mark logos. You can list more than one type, but separate them with commas. Do you have any color preferences or any existing colors you want in your logo? Please list them below, you can either name the colors you like or supply me with the color information by giving me your colors in Hex Code or CMYK or Pantone number. There are a couple of ways of doing this, you either write everything in the text box below with links to each logo and add your comments below each link. Or create a Google Docs document in your google drive and make a shareable link and paste it into the text box below. Or upload your Word Doc into dropbox or google drive and make a shareable link and paste it into the text box below. Or create a Milanote board share me a "Secret Link”, please view the “Design Process” block and see the “Make a Milanote inspiration board!” for more details. Also if there are any images/symbols/icons you like; images you feel sum up who you are and what you do? Your logo wording, please write the company name carefully, if it’s in uppercase/lowercase only or title. If you don’t have a specific preference then you can write in brackets (ANY STYLE). My services are NOT available to SOME businesses and products; so I do urge you to read the terms stated above before moving on. Do you have a company tagline that could be used as part of the logo? For example, "10 employees" "50 employees"
Is there any unique story behind your business or your company’s name? How do people learn about your company’s products or services? What is the overall message you want to convey to your target audience and how do you want them to feel when they view or think about your brand? Please list any local, regional and/or worldwide competitors. We absolutely need to know how your competitors brand and position themselves before we can create a visual identity for you. Please provide me with links of websites and company names of your competitors. Is there any other specifications that you would like me to know? I would be grateful if you could tell me how you found me, or who referred you? For example, via: Google, personal recommendation etc. You have read and agreed to the terms listed above. I have read and agreed to the terms listed. Minimum budget is $1500 and it includes 2 concepts and 3 rounds of revision. The larger the budget the more features, revisions, and alterations I can do. Fill in the form by clicking "LET"S GET STARTED »" button above, please take your time while adding details about your logo and be clear and precise about what you want. Please read each note available for each section to help you out as you fill in your information. The process of a custom logo is long and demands a lot of effort so in order to accept a project I must be very invested and very comfortable to work on. After reviewing your request and considering your budget I’ll have a reply back email with a 1 or 2 offers, each containing their own details. This is the point where you decide to accept an offer or to discontinue. For a $1500-$3500 budget logo, the duration will take around 30-50 days and a deadline date will be provided once an initial deposit is made. Make a Milanote inspiration board! Please provide me with the color information that will be used in your logo design. This information can be provided either in Hex Code or CMYK breakdown or even a Pantone color, please see the example image below. If your knowledge is limited about color please read this [ article ] for more information. For more help on finding the best color combinations please see the list of links below. If you don’t feel like going through all of this hassle, you can just simply write down your list of colors that you like. An organized presentation that contains all the information provided by the client, the designer will do a walkthrough over each slide to confirm the details that the client has request for the logo design. For a $2000 budget logo you will get 3 logo presentations with the 4th being the last to review before packaging your design. 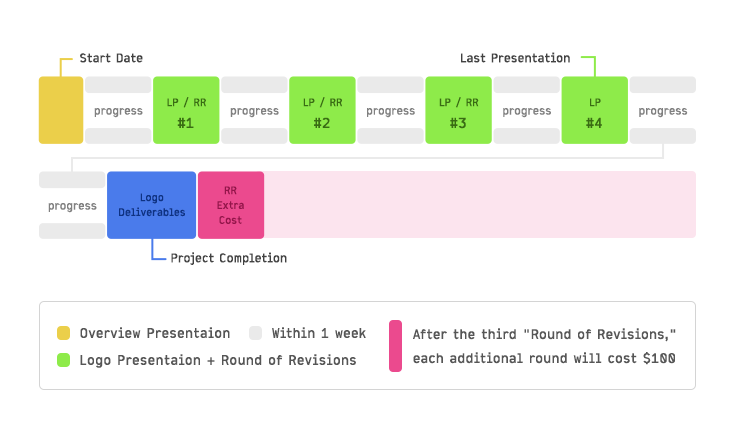 You'll also get 2-3 rounds of revision and if you decide after reviewing the 4th logo presentation that you need a another round of revisions then that will be an additional $100 for each round of revisions that come after the 3rd round. Note all additional costs will be billed in a separate invoice to prevent any confusion. Please see the image below to see the timeline scope. The client must answer back any email feedback requested by the designer in order to proceed with the project. Feedback must be provided within 1 business day. Delay on feedback will push the project completion date back by the same number of days delayed. If Reached a total of 5 days of delay in a row, this will result in putting the project on hold until the matter is discussed. For budgets with $4000 and up they have the option of 3 business days to reply back, but the their timeline is longer than the minimum budget projects. Once the remaining amount is paid off, an email with the package will be sent directly to your inbox. The files that are included are EPS, JPG, PNG, and a PDF presentation containing all your logo alterations and color information. I’ll be using the PayPal invoice system. After your request has been accepted, a 50% deposit is required in order to begin the project. The other 50% will be paid upon project completion. When the project reaches completion, an invoice reminder will be sent via email for the remaining amount due. Once the remaining amount is paid an email with the deliverables will be sent directly to you. Late payments will have a late charge fee of $50 per month after the project completion date. You can only get a refund after 24hrs of your first paid deposit, anytime later is not eligible for a refund. If you decided to discontinue/cancel the service midway, your 50% deposit is NOT refundable and you will ONLY keep one design concept from the list of concepts presented during that period. At project completion, the client will ONLY own the rights of the logo design after paying the remaining amount due. Every week a new logo design! I’ll be posting new and original logo designs and updates in new services, so follow me on Instagram @momethod and don’t miss out the COOL STUFF!